Super Mario Run has had a mixed launch, it's fair to say, something we wrote about recently; it's had staggering highs and quite a few lows in its first week. Some broader figures have started to emerge. Nintendo, for its part, has given an official (albeit broad) number for downloads over launch, stating that the app exceeded 40 million downloads in its first four days, described as a record launch for the App Store. Estimates had already come up with similar figures, but now they're official. 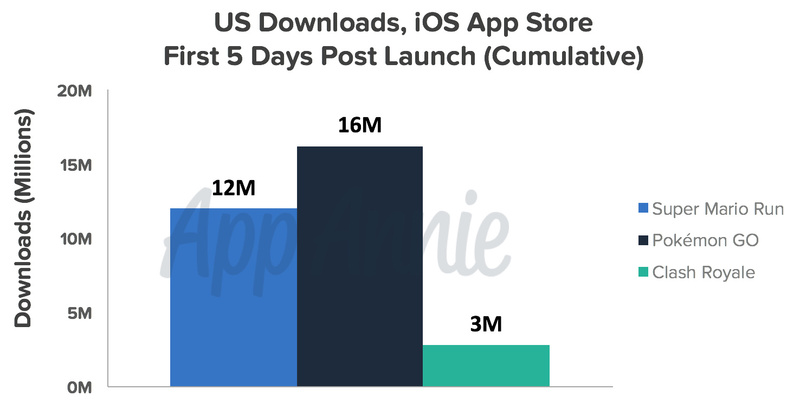 App Annie, for its part, has produced a comparison of launch downloads in the US market, showing the recent release to be lagging behind the phenomenal trends we saw with Pokémon GO, but still well ahead of a conventional blockbuster hit on mobile. Nintendo's press release states that there are improvements to be made in helping users understand the content on offer with a purchase, which is tactful corporate-speak for "we got the in-app messaging wrong", something we and many others have highlighted. App Annie's article highlights how the abrupt purchase message after three levels is throwing players off - "of the more than 40,000 total reviews that Super Mario Run has received in the United States, more than 25% are critical reviews that mention '3 levels.'" That is a problem that can be remedied, of course, with greater communication in the app and a change to the general game structure, perhaps. While launch momentum is tough to recover, all is not entirely lost for Nintendo. In the current day charts at the time of writing the app is still top 3 grossing in territories such as US and UK, though in Japan the free download is number one while the app is down to 16th in the grossing chart. There's work to do for Nintendo and DeNA. It'll be interesting to see how the app evolves in the coming weeks. Erm... I mean even higher than Clash Royale. Great Job, Nintendo. Mama... I mean i'm impressed. There was also the news about that on my local newspaper this morning. I think one of the best ideas would be to make sure that when the app are downloaded that the free courses 3 are a free trial/test kind of thing and that in order to get the full experience you have to pay something, but I do agree that it would be nice if there was more depth to the Kingdom Builder. (Making the Kingdom Builder have a Kairosoft game like mode wouldn't be a bad thing I think). And having the World Tour be internet free or at least some sort of mode that's doesn't require internet :+). Also of course, congrats Nintendo with all ready getting around 40 million downloads in just 4 days ^^. Yes but how many of those people actually paid for the full game? I'd venture far less than 10%, probably less than 5%. Nintendo always put spin on their press releases. I'd love to know how much money it generated then we could work out the percentages. It should have released as 2 separate downloads,free trial version and paid version,just like lots of other paid apps do. There can be no confusion that way. How they came to the decision to hide that you'll need to pay for it within the app I'll never know. It's kind of deceptive really and it's no wonder it's been hammered in the reviews. @Kimite the play the first few levels where clever i got hooked and had to keep playing, i was doubtful on the game till i played it and realized oh this isn't that bad for a spin off. also i like the levels feel like design went into them, not the same thing looped till you die route. @OorWullie more apple than nintendo it's there storefront, but yeah a try instead of download would had helped too. @SLIGEACH_EIRE um sony and ms do the same thing we shipped x amount of this, not sold through of cause that'd make things look bad at times. Great idea! Now that the game is out there, make it better! All companies give their shipped numbers, in fact, when you look at any kind of sales data, it is almost always shipped numbers because they don't actually know how many copies are in the hands of the consumers. All they know is that the retailers bought "x amount" and they are selling in those store. The only time they may know the actual number is if I was a digital only title. So it is more a "we don't actually know" thing rather than a "we should show shipped to look better" thing. This is why when SE post their 5 million sales for Final Fantasy XV, they said sold digitally and shipped because they don't know how many physical copies actually sold and are in the hands of the consumers. 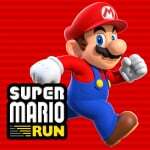 If Super Mario Run does fizzle out and can't have long tail legs, at least it might mean Nintendo sticks with concentrating on games on their own hardware, rather than put the good teams on mobile. Personally, that would be a positive. As I've stated multiple times already, I fear a week launch window for Switch (great first month like WiiU, then bad sales), and then Nintendo decides mobile is the only way to survive. This much negative reaction to SMR could deter that. Do you prefer mobile games or pachinko machines? There are a lot of cheap kid toys with Pachinko concept from China. One of them are attached on pencil case so kids can play with tiny metallic balls and start over again whenever they want. 40 million downloads is still a hell of a lot of publicity, paid or not. At 5% attach rate, that is 2m sales in 4 days. Which is around $20m minus the 30% Apple usually gets. If it ends up doing $100m on iOS devices, is that a bad outcome? It will have very long legs, if not "forever". @SLIGEACH_EIRE Bloomberg and some other company estimates it made 21 million in the first three days. It's still at the top of the paid apps section here in the us. @kenrulei I really like Super Mario Run and especially Toad Rally and I am the kind of person who is used to paying for app games one time to unlock the full game, so didn't mind spending something on Super Mario Run :+). So yeah, enjoyable game ^^. Still I do hope the Kingdom Builder get a mode like Kairosoft games, even though not that likely maybe unless Nintendo decide that they need to add a lot. @faint That would make it around 6% of the people who downloaded it went on to purchase the full game. Though we need to wait for definitive numbers. The free download, mind you. @SLIGEACH_EIRE I have a feeling we will never get those for any iPhone title developed by Nintendo. It's seems like something they would be quite secretive about. @hieveryone Yeah, having a demo or a lite version would probably be better considering how the casual market reacted and got confused by that they had to pay to unlock all the content at once for a mobile game when it seems maybe completely free at first. If anything Nintendo should make sure to add that it is a free trial at first and not the whole game at first, so the more casual users are aware :+). Other companies release two versions of their apps: a "trial" version that can be downloaded for free, and the full, "paid" version with its price listed up front. There'd probably be fewer complaints of a "bait-and-switch" if Nintendo had done that. @Dr_Corndog I may be wrong, but I think the days of having separate trial and a full versions of a game were way back before apps had in-app purchases. It's actually worse to have 2 versions, because people can get confused as to which one to download, or have issues transferring progress from one to the other. IMO, having a single version that you can unlock is much better and cleaner. As this article stated, the problem Nintendo has is more about letting people know more clearly what they'll get when they unlock the full game. @SLIGEACH_EIRE it is a question, but clearly not the only measurement, as with pokemon go, the real question beyond that $10, is how it moves people to buy Mario related games and consoles, as this is Nintendo's ultimate goal with mobile gaming. @nab1 I don't know about iOS but on Android it's quite common to have 2 separate versions on the app store with a shortcut within the free version to take you to the Playstore to download the paid version. I like the game and the price is high but not insane. £4.99 would have been closer to the sweet spot. Why is Nintnendo so poor at their marketing/messaging. To fumbling to message of the Wii U to even more recent examples lke being unclear on how to get Tom Nook to appraise your town for bells to Super Mario Run. Nintnedo should not be having this many issues with this. The messaging on the cost is perfectly fine. If you need help understanding it, then you should probably get an adult to explain it to you. This whole argument is stupid. @Crillan Yeah, that's on stupid people. Especially since it says right there on the itunes page I'm looking at as I type this. "Top In-App Purchases: 1.) 6 worlds for $9.99. Those 25% of reviewers are pretty dumb. "Oh look a free game. No microtransactions and the whole game is free? Totally gonna happen!" I could see them announcing Mobile Game revenues to their shareholders. It seems kind of important to them. Right now, that would seem to be Mario Run only, but could be mixed as they come out with more stuff. If they released two separate downloads, then they wouldn't be able to charge families multiple times for multiple members. At least as I understand it you only unlock on the device you buy on since it's in game. Store purchases would be unlocked at the account level. Knowing how Nintendo rolls, I think they did this intentionally. @Crillan One of the main examples of how the messaging is poorly constructed is the game actually cutting you off 20 seconds into the first boss level. Not after it's finished. Right in the middle of it. That is the epitome of what Nintendo fans once dreaded about the mobile platform for years. "Alright, I just need to time my jump to dodge these jumping fireballs, and then..."
"Stop right there! You need to pay this much to finish the level and the rest of the game! Now hand it over, or get lost!" "Cool! I beat World 1! What's next?" "Congratulations on completing World 1! We hope you've enjoyed your Run thus far. If you'd like to continue on to World 2 and beyond, please grace us with your hard earned money... Otherwise, feel free to have another Run through World 1." @ThomasBW84 - it's now at 50,000,000+ Also - 3ds consoles sold outings UK ? :! ( some bundles are still available ) in UK! @PlywoodStick It clearly states that you can try the boss level for only 20 seconds BEFORE you start it. What else did you expect to happen when time is up? Let you play the rest of the level? And it basically says exactly what you're suggesting. It just does it at the end of 1-3, not 1-4.